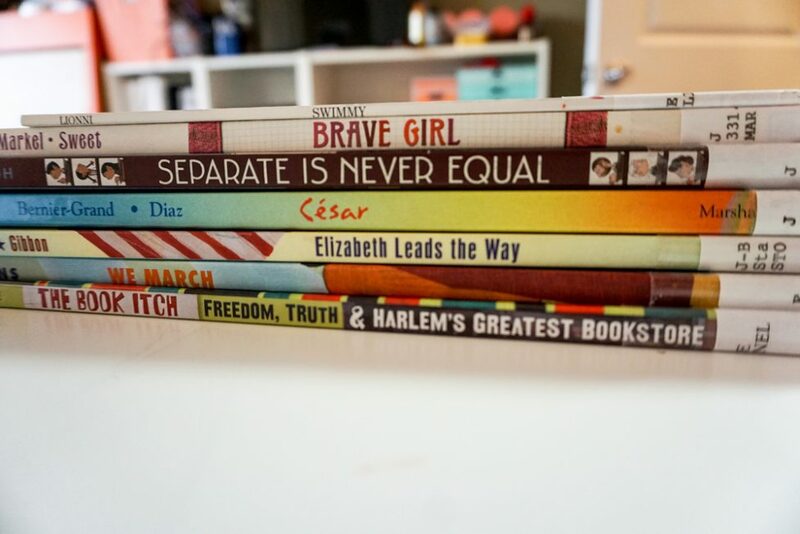 I’ve read them all, but I haven’t read all of them with H. We’ve talked about Clara Lemlich in Brave Girl especially, because we set up H’s new sewing machine this weekend. It kind of gave me an in to talk about sewing as work, and what sewing work used to be like for some women (the conversation about what it’s still like for many women in third world countries is maybe for another day). I felt like I was tapping into a longer topic, of how traditional women’s work ties into early feminism, the oppression of women. And how we subvert that in modern life, and women (or men) can choose to have domestic skills, and not necessarily be oppressed by them. I find sewing incredibly empowering as an art form, but I’m also aware that this is kind of a first-second world luxury. Piecework, non-union labor is still the law of the land for thousands of working women in poor countries. I’ve also been thinking about protest quilts, their history, the history of black women quilters, some of the incredible modern examples. I want to read more on all of this and revisit it at some point, but because sewing is so close to my heart it’s been leaping out at me from that list I made. And with H so eager to try sewing…it’s very much in the front of my thoughts this week. But also, I cannot recommend The Book Itch enough. Boy, do I love that book. It’s gorgeous to look at, I love the story and the history. It’s an excellent, kid-accesible book about the African National Memorial Bookstore. The death of Malcolm X is part of the plot, but I think it’s handled so well. The book doesn’t shy away from the truth of it, but it doesn’t rest on it and make it the thing you walk away with. So, check out the list at GeekMom, and get to the library!